I'd like to think that people are well meaning when they dispense their parenting advise on how to better manage my child who has Aspergers, OCD, ADHD, panic, anxiety, sensory processing and tic disorders. Needless to say, this grouping of behavioral issues makes life difficult for him and, in turn, for us. And, apparently, for those unfortunate people who have to bear witness to it all. 1. You should spank him. Really? Do you think he wants to behave the way he does? Do you think that hurting him physically will make him change his behavior or just make him more upset and confused? Generally his hyper-focus makes it difficult for him to switch gears. If that's not the issue, his behavior is a result of him not understanding what he should be doing in the situation or is a way of trying to control his environment to reduce his anxiety. Hitting him will only make him more anxious and confused. 2. You should make him eat all his food. He has a fear of swallowing and a phobia of eating certain foods. For him, trying to have the most relaxed and supportive environment is the best way to reinstill a positive relationship surrounding food. 3. Don't give him whatever he wants to eat, he won't starve himself. Um, yes he will. Fear and panic trumps hunger every. single. time. See #2 as far as how establishing a positive relationship with food goes. 4. You give him too many choices. Just tell him to do it. Having controlled choices that he can decide helps give him control over his environment and reduces his anxiety and still gets him to do what we need. 5. Don't let him wear those old clothes. He looks like he's homeless. Having sensory processing disorder, OCD and anxiety means that he feels safe when he wears certain clothing. Taking that away from him only makes him feel anxious - transitioning him to new clothes is the more desired method. Making fun of him and berating him will not help. At all. But it will make me want to strangle you. You are a brave, strong mama! You know what your child needs and you do the best you can. Your son is lucky to have you. Oh wow, I have panic disorder and GAD as an adult, I can't imagine what that must be like for a little one. It's good you're posting this, parents are so incredibly judgmental of other parents, we need more posts like this out there. Good work! All children need to be treated with the consideration and patience you are advocating. And good for you for doing it with a special needs child who needs extra compassion and support. Oh go tell people who tell you these things to go piss up a rope. I mean really. It is not any of their business. Henry is fine just they way he is. He has two great parents. 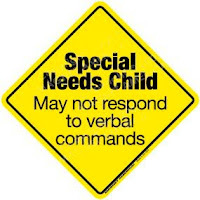 I used to teach special needs children and we also have many asperger's children in the extended family. Their world is not the usual place and I hate how people judge. Just as no child would ask for this burden neither does the parent. You do the best you can day by day. Some days are easier than others. It is my firm belief that parents and children in this position need support and not criticism. Food on you for trying so hard and if one person questions their attitudes you have done well by posting your thoughts. You just keep loving that child and doing what you know is right. No one else knows what you're going through. I do sympathise. My son has (relatively mild) ADD and tics, and I suspect mild autism/Aspergers. Enough for him to seem different but not enough to get many teachers/medical staff to take us seriously. Luckily his previous teacher was fantastic and very supportive. Anyway, his problems are exacerbated by the fact he is head and shoulders taller than his peers, so people expect his behaviour to be better than it should be for his age anyway. I hate it when people tell you to just make a kid eat whatever you are serving. I don't like every food in the world and I know kids don't either. When I was a child, certain things I love now, like avocados, were absolutely sickening to me. I am not into spoiling, but I want my kids to trust me too and feel like I have their best interests at heart. Sometimes if I am making weird food that I want it just makes for a nicer evening if I make them something different. I think your child will grow up with love and will trust you since you see him as an actual person with distinct needs rather than a blank slate you can just impose your will on. I'm amazed every day at how stupid people can be while considering themselves well-meaning. You don't need my assurance that you're on the right path, but if a collective "Yay, you" vote helps any at all, you can add me to it. I don't have kids, but subjecting them to a "just do it" attitude in the face of phobias would be as disastrous as taking a dog who is afraid of men wearing boots and dropping them off in a locked room full of construction workers. The dog will either defecate on the floor or bite in response to the panic (or both if you're particularly unlucky). Fears & anxieties are located in the most primitive parts of our brain - the part we share with mammals & even reptiles. Which is why I use the example of a dog - anyone who knows anything about pets realizes you have to do careful counter-conditioning exercises to rid a dog of its fears and in some cases - accept that you can't eliminate them. Same deal for your son's food/swallowing fears. In the end, some people are idiots. "My kid's autistic. What the hell's wrong with yours?" My son has Asperger's and an anxiety disorder, and both were diagnosed very late - like at age 11. As a result, he has the social skills of a 5 year old, and he's in intensive therapies to try to work on his deficits. He tests off the charts on science and language, though, and responds very well in supervised situations with adults. So I often hear the opposite: "What do you mean? He looks perfectly normal to me!" and "Well, just MAKE him do his homework!" or "Let him fail a grade - he'll learn to turn all his work in!" Thanks for sharing - I didn't know your son was challenged, too. In some ways I'm lucky - Eli, my oldest, is quite severely autistic. Virtually no one mistakes him for a neuro-typical kid anymore (much more common when he was under 5), or expects "normal" behavior from him - it is just too obvious how disabled he is. I certainly get some of those comments from people (My favorite one was the elderly lady at our synagogue who looked at the blunt toy his was shaking...by himself, far from anyone, and said "he's going to hurt someone with that!" My friend responded sweetly "He's being watched, he's fine." This prevented me from saying "Hey, lady, we took away the sword, what more do you want?" At the same time I totally get your frustration, I guess it doesn't bother me that much, personally. I tend to hear in people's comments less criticism of us (although I'm sure that's there) than ignorance - because I know I've been guilty of this myself (why can't X behave...oh, wait it turns out that X has some serious issues or family things I just don't know about.) Not saying you shouldn't hear it as criticism, or tell them, as Rob says, to piss up a rope (sounds good to me), just I'm so implicated myself in judging other people unfairly that I find it hard to assume evil ;-). Wish I didn't do it, though. Being a parent seems to bring out the obnoxious, know-it-all side in some people and it can be tough to deal with ridiculous comments all the time. I get advice and inappropriate questions frequently about my twin daughters. The advice almost always comes from people who have children close in age because they seem to have the misguided notion that it is the same as raising twins. The inappropriate questions range from "did you use fertility drugs?" to "which one of the two is smarter?" It seems that no matter what your situation, there will always be morons. You know your children best and I'm sure you're doing a great job. Heck, I don't even force my normal kids to eat everything. I force them to try one bite and if they don't like it... they get a pass. If it is something they 'should' like then they still don't have to eat it all but not eating it will result in no snacks til the next meal. My step-daughter tells me at the end of the meal to save her meal if she doesn't eat it. When she wants a snack, she will finish it and then ask for a snack. She thought that one up on her own. I have to smile at her ingenuity on that one. And clothing... I couldn't care less unless the clothes are completely inappropriate. Going outside in shorts in December? Not going to happen and I don't care how much you like them. Find some pants you like. On the other hand... short of anyone being in actual physical danger? I probably am not going to be parenting your kids because I have my hands full with parenting mine. I think I am too busy dealing with my own life that I don't have time to be poking my nose into someone else's life. So your kids can eat whatever, wear whatever and do whatever without much comment from me. It never dawned on me that most people didn't operate that way. I've been a teacher for 13 years and have had many special needs kids in my classes. I am constantly amazed at the ignorance of people and their limited knowledge of how much some kids struggle. With my whole 13 months of parenting experience I am further amazed at the amount of "friendly" advice that sheer strangers are willing to give you while you are out. I'm sure I will make lots of mistakes as a parent but feeding my kid isn't likely to be one of them. You do the best you can and parent your child with the knowledge you have at the time and with all the love the can absorb. I don't what they were thinking saying such things to you but none of those things sound well meaning just hurtful and disasterouse. Good thing your son has a mom on his side. Nurturing your child (any child, really), in this cookie-cutter, 'efficient' society is always going to be tough. What is discipline in one family is aggressive and damaging abuse in another - and not all that were abused appreciate their damaged backgrounds and perceptions. I at least hope that for every misunderstanding about discipline and fitting in, you get an encouraging smile or greeting, a moment of quiet reflection from a bystander, or even a word of encouragement and support. I keep telling myself, "Well, even the village idiot has a story to tell. Eventually." We've dealt with sensory-based feeding issues for years. "He won't starve" is the comment that upsets me the most. We're just starting to see other behaviors emerge in the preschool setting, though we do have very supportive teachers. Your term "hyper-focus" gives an interesting perspective. We're pretty laidback at home, so it confuses me when his teachers tell me he has trouble with transitions. I know you're sharing this to help other people be more understanding, but thanks also for sharing this for parents who are a few years behind you and still figuring this stuff out. I agree with Gina, all children should be treated with the love and respect you are advocating. People don't seem to realize their ignorant words can sting for years...since I've never found a nice but blunt way of telling them to get educated and experience with the issues involved in raising a special needs child, I just give them a disgusted look and try not to let it bother me. Sometimes I do pray for them, though. I wish there was a better way to deal with it all. I don't know. I think e4's t-shirt idea isn't a bad one. Start carrying his birth certificate with you. Then you can pull it out of your purse, have the offending party look at it & confirm that "yes, I am his parent & therefore I am in charge, not you". It worked with my husbands parents--we too got tired of the "you should spank him", "MY kids never acted this way", etc. It is unbelievable how intrusive, insensitive and idiotic people can be. You are a great advocate for your entire family. Rock on! My son was just diagnosed with Aspergers in December and started school at the end of January, so I am just getting used to some of the comments and still wincing a lot as he's very smart, sensitive and anxious and picks up on a lot. Its so great to hear from other mums who are/have been there, thanks for sharing. You know so much better than strangers what is good for your kid. I'm with Rob - "Piss up a rope". Before my eldest child was even born, a friend (with two children) told me something I've never forgotten: "The easiest thing in the world is to parent someone else's child." (not *actually* parent, of course, but armchair quarterback type parent) I'm thankful to have learned that, since there are so many times I want to think "if that were MY child, I'd..." I'm sorry that stupid, ignorant, and in some cases mean and/or spiteful people feel the need to blather at you! Ohh. I can feel your pain. Our system is design for everybody to be "standard" and if your kid is not, then it most be something wrong with you. The beauty of individuality is lost in this society. Maybe because school are overcrowded but it is very difficult for a parent to surf this world when our kids are special. Maybe your kid is more musically incline or sport incline or he likes art, then the standard doesn't apply to him or her and you start with the problems because he is consider disable. Mine has many "problem" in school which I consider his great personality but his teacher and other adults would like him to be like other kids. UGRU!!! It is been really hard because I don't have more resources to send them to hell. One time a stranger decided my little guy shouldn't be climbing so high on the playground, and tried to grab him down. She came and complained to me when he kicked her(apparently she both thought he was "unsupervised" and saw his mom right there, at the same time.) I told her I thought it was appropriate for him to kick strangers who tried to grab him without asking. HOO BOY. You're being a better grownup than they are, just by not sniping back at them. So you're not just a good mom, you're a good example. Thanks for speaking out about this. It does hurt when people refuse to be understanding and consider what special needs of one child can do to his / her life, as well as the entire family. I've dealt with it many times with my little dude who has his own bundle of things he deals with. You sound like a great mommy. Your post made me sad. I have a child with autism and she has alot of anxiety. Luckily the OCD and sensory problems have faded, but I can relate! People that mean well can really hurt. 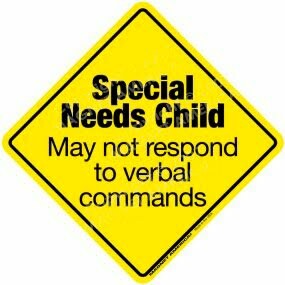 Every child with special needs is very different and the way they react is different. The way we parent our daughter is different then how we handle our son. Hang in there!